It’s official: David Bowie is back in Aylesbury. But what on earth is he doing here? On Thursday, the town witnessed the unveiling of the new, long-awaited statue of Bowie by Andrew Sinclair which is situated in the Market Square. It’s an unusual move as Bowie wasn’t from Aylesbury, but in some senses his connection with the town is deeper than a residential address: his debut performance as Ziggy Stardust was at the town’s Friars Music Club during 1971 and 1972. So why place a statue of a non-local musician in the centre of Aylesbury? In some senses, the Bowie statue is a small marker of a long history of music in the Vale. Friars was legendary for helping to launch many music careers, including The Police, Def Leppard, Howard Jones, Toyah Wilcox, Fleetwood Mac, Genesis and Marillion. The list goes on and on, and there isn’t enough space to list them all here! For twenty five years, the town forgot about it’s musical heritage. Friars closed its doors to the contemporary music scene in 1984 and apart from more commercial concerts at the Civic Centre, the music scene went quiet in Aylesbury. In 2009, the town woke up from its slumber and the Friars Music Club was reborn; interest from ardent fans and the closure of the Civic Centre meant that there was a hunger for music in the area. I’m hoping that this is the beginning of something good for the Aylesbury music scene. One of the questions I have is, why not honour the musicians who are local? Most notable of all, would be Marillion, one of Aylesbury’s most famous exports. If the opening lyrics of their hit Kayleigh are to to believed, “Do you remember the cherry blossom in the market square?,” the town is embedded in their work. It would be good to see their music and local contribution being honoured. 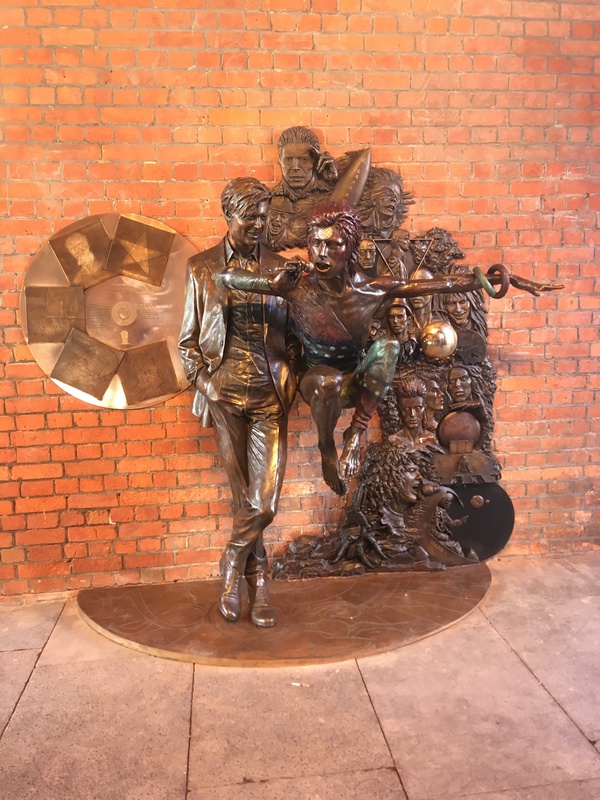 The Bowie statue puts the town on the map and further cultural exploits would make the area a music destination and bring in a new level of tourism and other musical activities. If you’re local you may have seen the publicity stunt around the town yesterday. 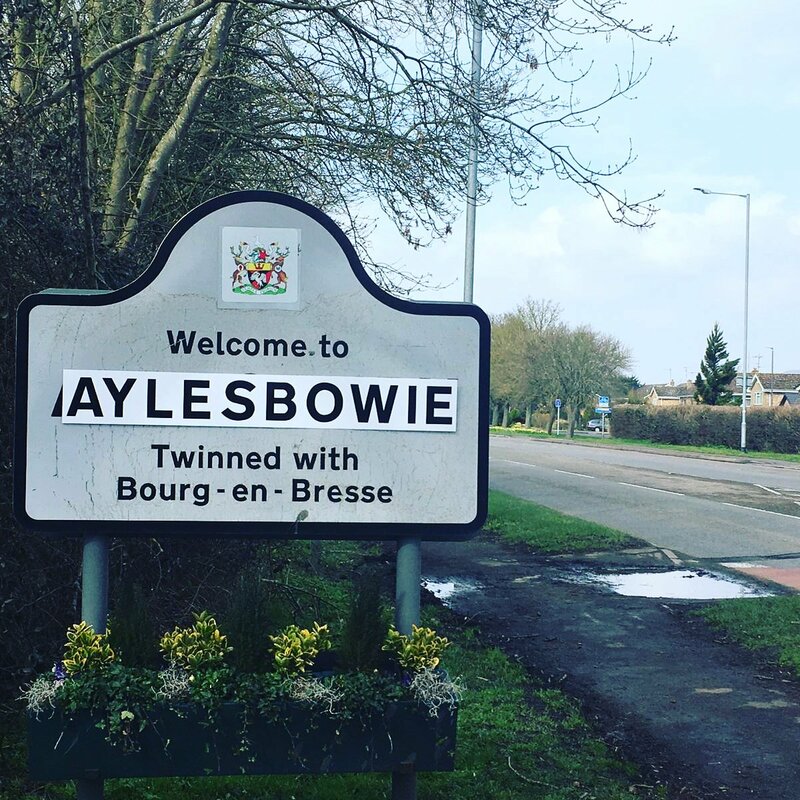 All over Aylesbury, the town boundary signs were changed to “Aylesbowie” to raise awareness of the launch of the statue, a gesture that made me and kids laugh a lot. It’s worked though as everyone is talking about it! One of children is hoping that the name change is permanent because it sounds more interesting! The Bowie statue was controversial and created a lot of discussion locally. However we should be honoured that Bowie chose to premiere “The Rise and Fall of Ziggy Stardust and The Spiders from Mars” in the town and that we are part of pop music history. Maybe this could be the impetus Aylesbury needs to start taking its music heritage more seriously. It’s good to see the town’s music scene start to rise from the ashes and it’s time for more diversity of genre and new venues to spring up. Sometimes things have to die off for awhile so that they can be reborn in a new, stronger way. You can watch the unveiling of the David Bowie statue here. So here’s a new song that I started writing back in 2014. I finally finished it a few weeks ago after pondering over verse two for four years! I’m hoping it will be recorded on a new project and will be creating a demo of it soon. Im very excited as my Helen’s Angels Patreons are the first to hear this song – this is a world premiere folks! I decided to go one further than the archetypal love triangle and write a love square! It’s about the interplay and regret between two couples and the history that they share. 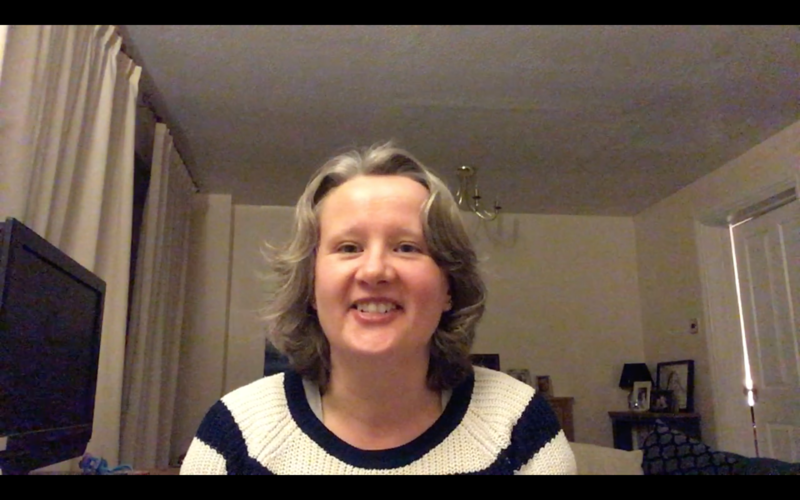 I hope you like the song – I’d love to hear you thoughts on it. To listen, click here to join the Helen’s Angels Patreon community.